Shares of Apple (Nasdaq: AAPL) hit a 52-week and all-time high on Friday. Let's look at how it got here and see whether the Mac maker can keep on running. It's been four long months since Apple tapped its prior record's intraday high of $644 back in April, and shares closed at $648.11, a fresh all-time record. Within the past few months, Apple went and posted a relatively soft fiscal third-quarter earnings release, giving the bears a little snack before going into hibernation before the booming holiday quarter. Snack they did, as shares dipped after the earnings miss, but now they've had their fill and the bulls are back in the driver's seat. Investors are expressing confidence that Apple has a lot in store in September, with Sept. 12 rumored to be when the company will hold its annual iPhone event to unveil the newest model. Not only are shareholders expecting a major upgrade and major sales and upgrade activity to boot, but it seems they are also beginning to price in the lucrative likelihood that the iPad Mini will be launched as well to take on Google's (Nasdaq: GOOG) Nexus 7 and Amazon.com's Kindle Fire. There are even rumors that Apple's television set has now entered full production, signaling a potential launch within a few quarters. Incidentally, Apple also just paid its first dividend in 17 years, amounting to $2.65 per share. 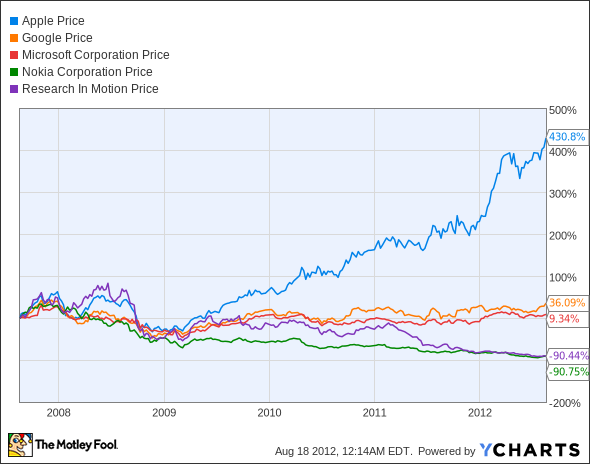 Let's see how Apple stacks up against some of its rivals. We'll also include some fundamentals for more insight. Source: Reuters. TTM = trailing 12 months. NM = not meaningful. Google's Nexus 7 is off to a strong start, and an iPad Mini would be a major threat to its early success. Nokia is rumored to announce a new Windows Phone 8 device just days before the iPhone event, which would be a bold attempt to go head to head. Research In Motion will sit on the sidelines this holiday season, as BlackBerry 10 is delayed until 2013. The next several months will be an exciting time for Apple, as it will revamp much of its product lineup and probably include some new additions. This rally is just getting started. Keep up with all things Apple by signing up for The Motley Fool's brand-new research service just for Apple. You'll also get regular updates on new developments as we monitor Apple so you don't have to. Sign up today.